This blog is a personal blog written and edited by owner. For questions about this blog, please contact us. 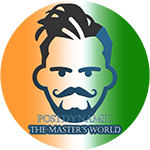 Postdynamic - The Master's World © 2016-2018. All Rights Reserved.